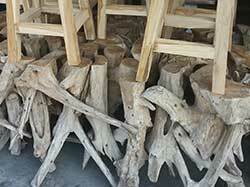 Teak root furniture for indoor and outdoor use. Made of the strongest part of the teak tree, the root. 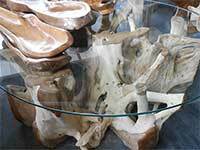 These teak root furniture are made of very old tree, many of them are hundred years old. Taken from government owned teak plantation. High quality wood, surely will last for generations. Contact us if you interested in buying these teak root table furniture. Various option for finishing including natural, burned or white washed. See also sliced teak root wood coffee table. Teak Root Glass top Table. 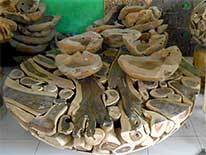 Teak Root Table from Bali. Bali Teak Root Table Furniture. See also teak root chairs furniture from Bali Indonesia. Unique shapes of root chairs. Suitable to use as chairs or garden planter. These chairs are very strong, made of teak root wood. Suitable for outdoor use. Please browse our catalog and make selection for your order. Email us your order in details with item number and quantity per item. We will calculate shipping for you.